During the 19th century fur trade, the Lower Fort Garry - a National Historic Site in Selkirk, Manitoba in Canada, is the oldest stone fur trading post still intact. One of the buildings in Lower Fort Garry is home to the General Store where the shelves are made of wood and the goods are neatly separated into sections. Besides the General Store, some other places to see at the Lower Fort Garry are the Industrial Complex, various homes, the blacksmith's shop, the museum, the furloft, the farmhouse and the bastions located at each corner of the fort. Visitors to Lower Fort Garry in Selkirk, Manitoba can browse through the General Store and the other historic buildings where costumed interpreters re-enact the daily duties encountered at the fort. The entire site is open from May 15th to September 7th and from September 8th to September 30th, the Visitor Centre is open and guided tours through Lower Fort Garry are available. From October 1st through to May 14th, the Visitor Centre is open for rental purposes and educational programs continue but the historic buildings are closed. Picture of the display of items on the shelves at the general store in Lower Fort Garry in Selkirk, Manitoba. 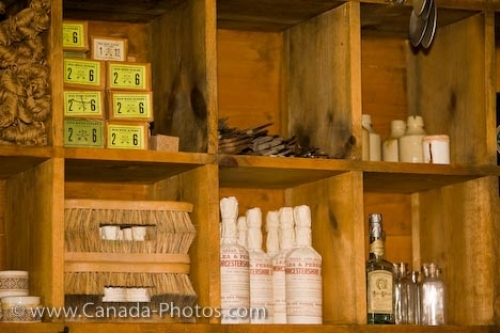 Goods on the shelves of the General Store, Lower Fort Garry - a National Historic Site, Selkirk, Manitoba, Canada.